I’ve got the Too Faced Chocolate Bon Bons Palette to share with you. This palette launches TODAY! 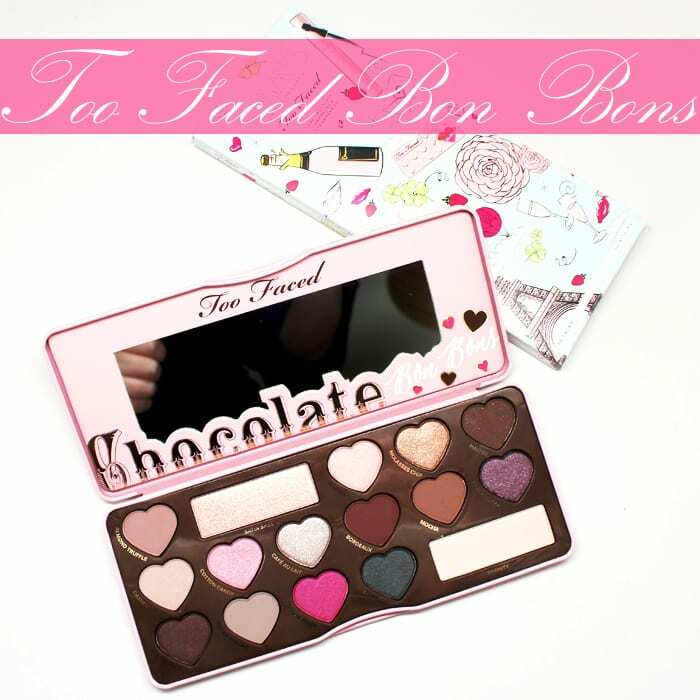 It’s the third installment in the Too Faced Chocolate Bar series. 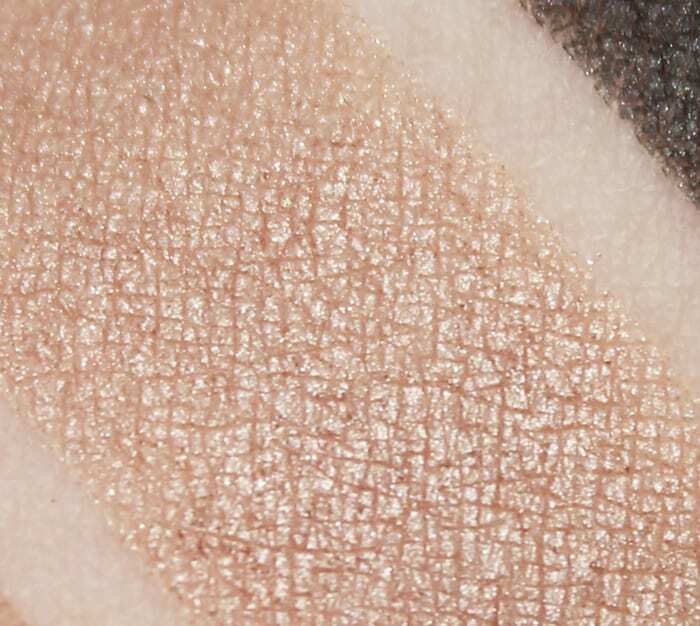 It’s got a great mix of mattes and shimmer, which us hooded eye gals will love. The colors are pinks, purple, taupes, grey and browns. Too Faced sent me this palette. You can see my reviews of the Too Faced Semi Sweet Chocolate Bar (Jan 2015) or the original Chocolate Bar palette (Dec 2013). 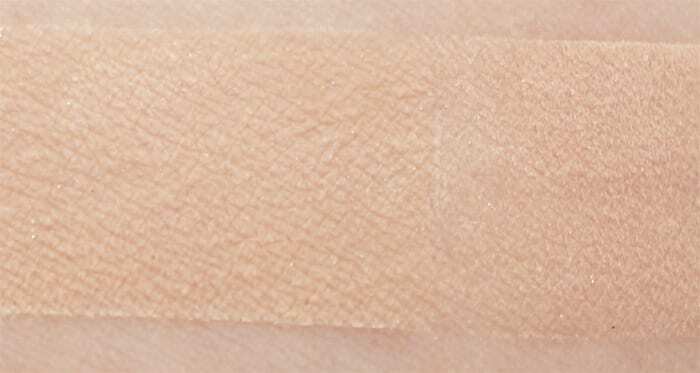 The left side of my swatches are on Too Faced Shadow Insurance primer and the right side is bare skin. 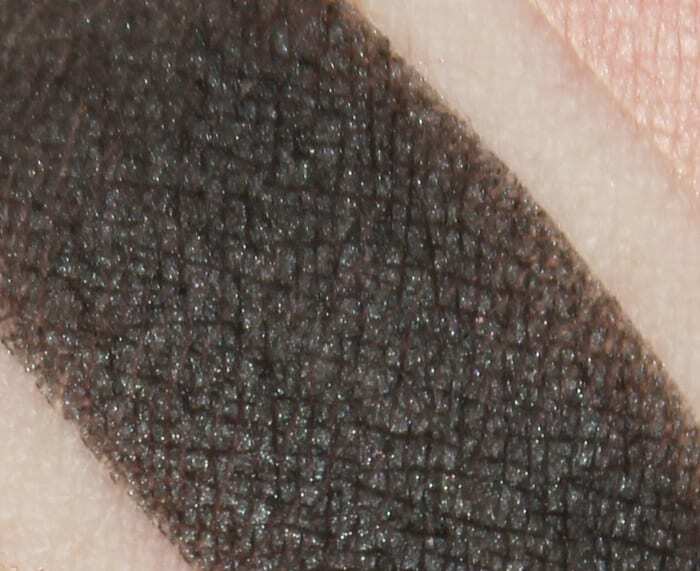 You can see where my tape line is in most of the swatches, as eyeshadow never wants to stick to that portion of skin. 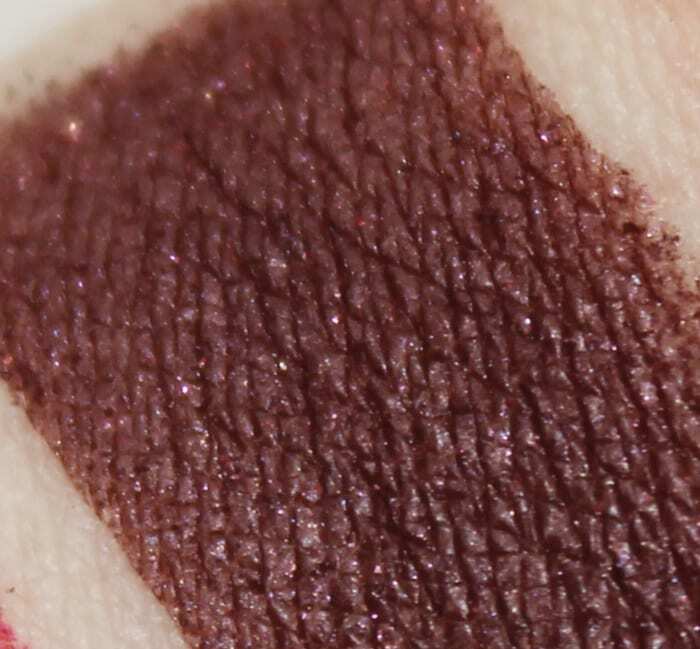 Brown with red-toned plum sparkle. When applied damp the sparkly purple is more apparent. Too Faced, why you gotta’ play with my my emotions? You’ve had real purples before, why not now? Why tease me with a shadow that looks purple in the pan but isn’t unless I apply it wet? Intense hot pink with subtle violet iridescence satin. 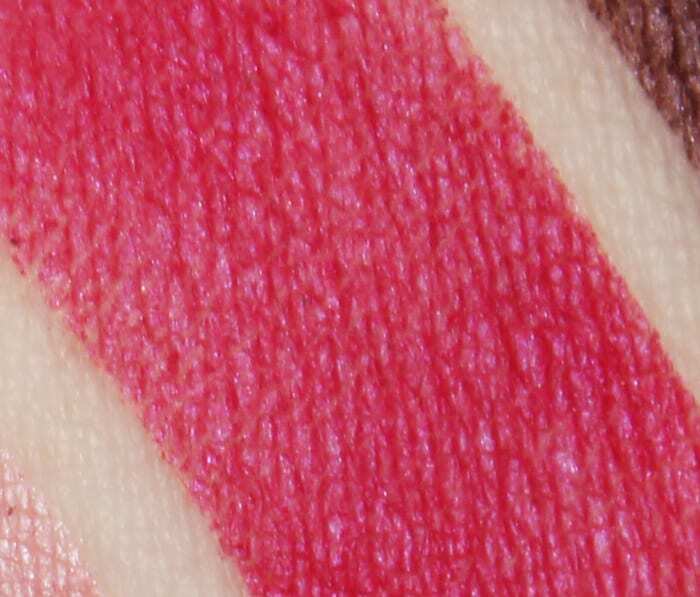 Midtone cotton candy pink shimmer. Slightly lighter than midtone pink with golden iridescence pearl. Light champagne with taupe tones and silver shimmer. Deep dark burgundy brown matte. I wish this was more burgundy with no brown tones. 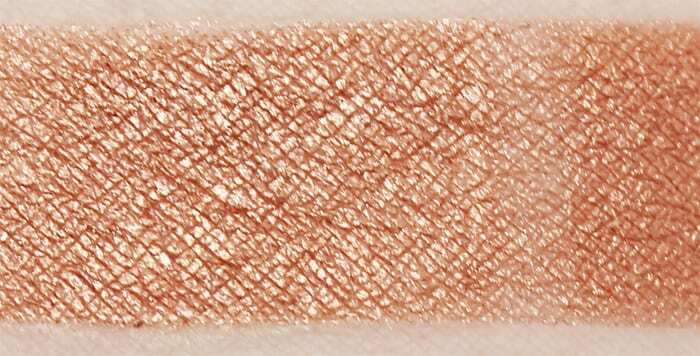 Dark brown with tiny glimmers, satiny. Dark pink taupe (deeper than Cashew Chew). Gold with hints of pink, great highlighter, inverse of Sprinkles. Pale creamy ivory matte, great base shade / blending out shade, erasing mistakes shade. Really useful for my skintone. For this look I used Divinity from lashline to eyebrows. I applied Pecan Praline to the hood and the lower lid. I used Earl Grey to define the hood and blended it out. I smudged Earl Grey along the upper and lower lash line as well as the outer lid. I applied Cafe Au Lait to the lid, I also applied it as an inner corner highlight and under the brows. For this look I used Divinity from the hood to the eyebrows. I applied Cashew Chew to the lid, hood, and lower lid. I blended Almond Truffle onto the hood and lower lid. I further defined the hood and outer lid with Bordeaux. I also used Bordeaux to define the upper and lower lash line. I mixed Totally Fetch and Sprinkles together for the lid and inner v I used Satin Sheets to highlight under the brow and at the inner corner. Check out my Totally Fetch tutorial here! First, I think the packaging is super cutesy, and in line with how Too Faced likes to do things – girly, cheerful, and bubbly. I don’t mind the heart shapes at all, as I had no issues getting my brushes onto the eyeshadows to get out color. However, if you don’t like cheerful and girly, you may dislike this packaging. Second, I was overall impressed with the eyeshadow formula. 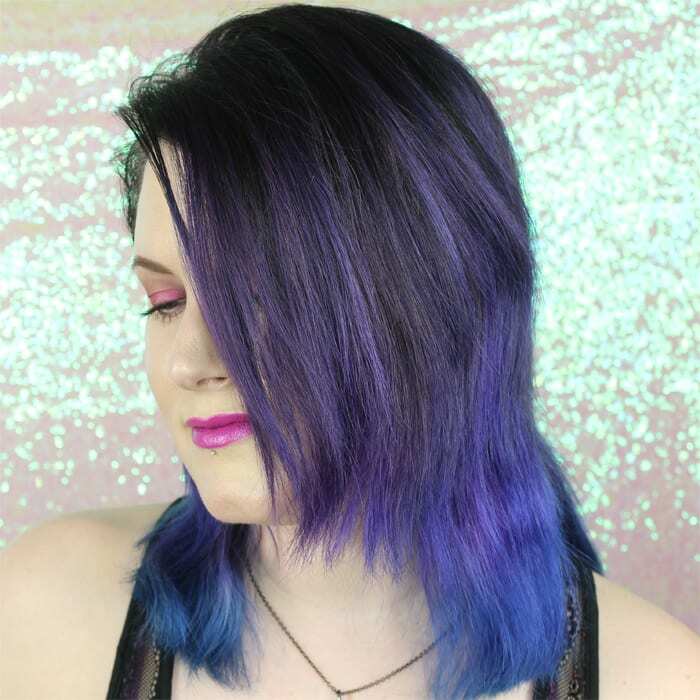 I created two looks with the colors to play with them and get a feel for them after I swatched them. I didn’t feel like any of the shades had pigmentation issues on bare skin or primer, though they obviously look amazing on primer. Now on to the colors. 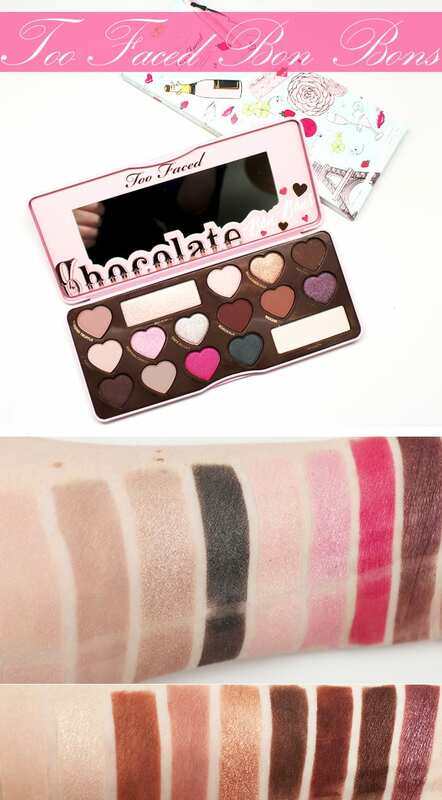 I’m very happy that there are so many mattes and satin-mattes in the palette, because that makes Chocolate Bon Bons very hooded eye friendly. 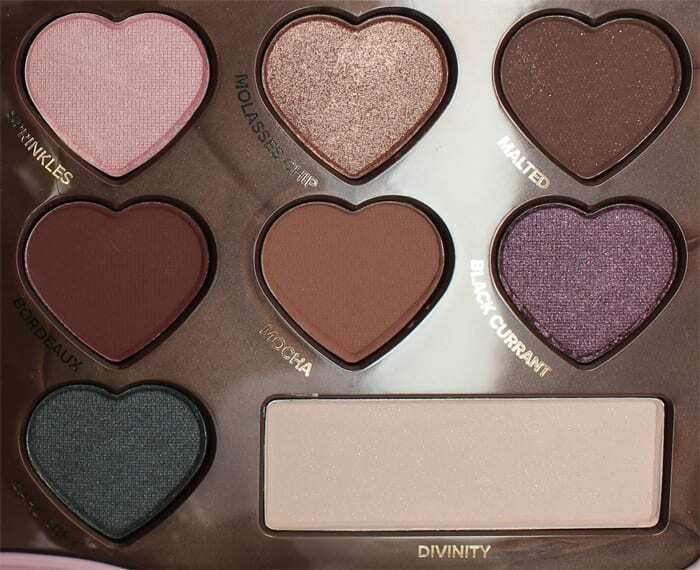 The palette has 7 mattes (Divinity, Mocha, Almond Truffle, Malted, Bordeaux, Cashew Chew, Pecan Praline), 3 satins (Dark Truffle, Earl Grey, Totally Fetch), 3 shimmers (Cafe Au Lait, Cotton Candy, Black Currant), 2 pearls (Satin Sheets, Sprinkles) and 1 metallic (Molasses Chip). It has a great mix of warm, cool and neutral tones. What I DID dislike about the palette was that Black Currant looks purple in the pan but is mostly brown with purple shimmer instead of being a true purple. I wanted a real midtone or slighty deeper than midtone purple. I also wanted Bordeaux to be more of a burgundy shade than a brown with burgundy tones. Aside from those two shades, I find the pinks, gold, grey, and taupes to be very wearable. I’m not as fond of the browns, but you can create looks with those shades too. What do you think of this third installment in the Chocolate Bar Family? 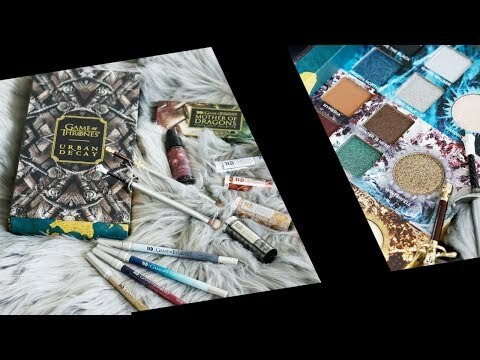 What would you like to see from Too Faced next? Thanks for sharing. 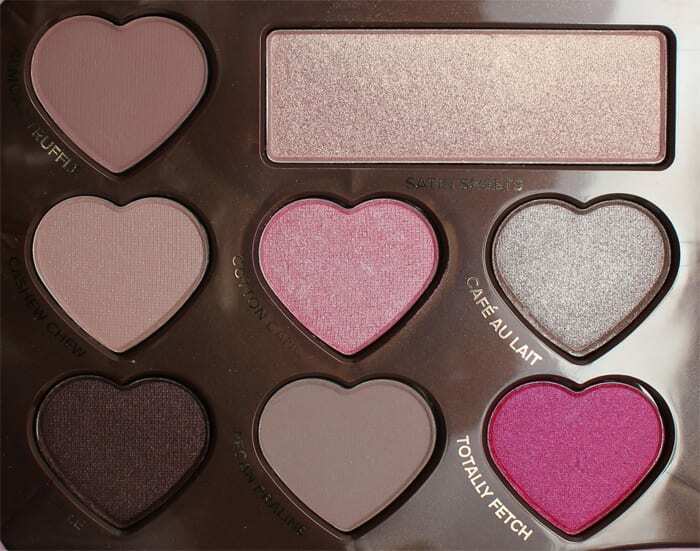 Im not sure i love this one as much as other pallettes but its definately cute. I ordered this beauty the moment it went live at midnight PST (3:00AM where I am, lol). I LOVE THIS PALETTE SO MUCH!!! 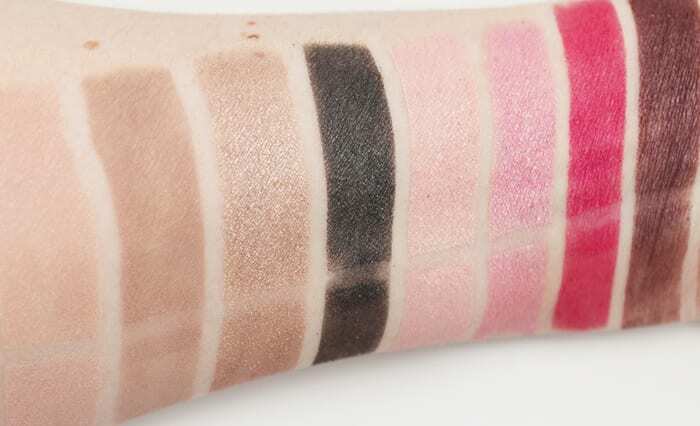 I am so happy to see so many mattes, pinks, blushy tones, satins, pretty colors that are super-wearable but still special, and THAT PACKAGING!!! LOVE!!! I have to agree with you on Bordeaux – I was hoping so much for more burgundy / less brown (pure burgundy with no brown would be my ideal!). It reminds me of my feelings on Cherry Cordial from the first chocolate bar. It’s a beautiful shade but the brown tone/s in it dominate the shade on my eyes. Ahhh I was also looking forward to THE PURPLE! It swatched sooooo purple on some people! I wore it wet along my upper lashline two days ago and while it was beautiful…I wasn’t feeling a Black Currant vibe which brings to mind that striking, very red toned violet. I imagined something very red toned, obviously purple or plum-purple (not “maybe purple”), and deep with a luxurious vibrance. I still love it but…I WANTED PURPLE-PURPLE TOO! Or PLUM-PURPLE! Just…100% THIS IS BEAUTIFUL PURPLE (like the Sugar Pop Palette). Pretty please! I am so excited about this palette. 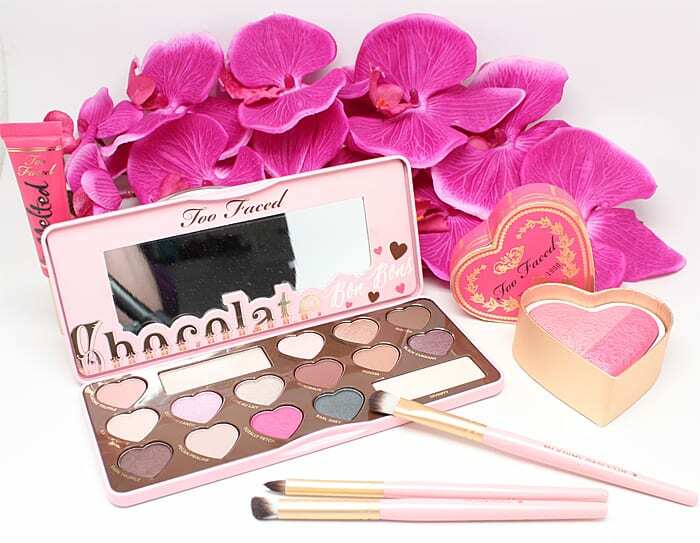 I love Too Faced, it’s one of my fave beauty brands, and this palette looks gorgeous. I’m especially loving Cashew Chew. I love the way they smell like chocolate and are so easy to apply, blend, and are so pigmented. Thanks for the swatches. A really pretty palette! Love the hearts!! Black Currant looks SO purple in the pan! It does but it will only show purple on me if I apply it wet. Otherwise it looks like a brownish shade to me. I wish it was more of a true purple. 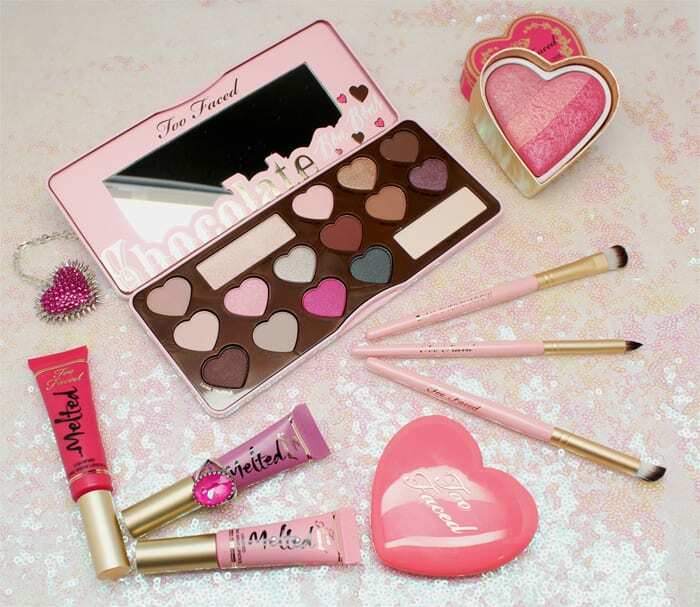 I love everything Too Faced. I have the first and second palettes are there any duplicate shades in Bon Bons? I don’t think there are dupes, I think they’re all new. I’ll try to swatch all three side by side soon. I really love the pinks and taupes in it. Much more flattering on me than a million warm browns. It’s so darn cute and the pigmentation is great! I’m so happy that my palette is on the way! Too Faced doesn’t disappoint! I hope you love it! I’ve already created one tutorial with it and I will do another soon. I had talked myself into skipping this palette and along come your swatches! I definitely want this! This palette looks beautiful and all those shades look gorgeous on your swatches! Well hello beautiful. I mean you Courtney, but this palette too… it’s gorgeous and I must have it. I just saw this one at Sephora, and although the packaging is totes adorbs I think I’ll skip this one. I just bought UDxGwen and a Viseart Neutral Mattes palettes, don’t think I need another one just yet. You picked up some pretty ones! Nice swatches! I love the color of the burgundy, but I’d confuse me if I was looking for a purple and then it looked like that on the lid. And the two dark browns look almost the same to me. I love how vibrant are the colors in this palette. Hey Phyrra, How is the color Totally fetch, is it cheer like Bubblegum from the TF Sugar pop? Totally Fetch is a bright hot pink shade, like in the swatch on my arm. Love the heart shaped pans! Why is this palette so pretty! I want it. Oh boy, do I ever need this palette! Thanks Rachel! I can’t wait to hear what you think of it. Glad to see that the colors are saturated. It’s so cute! Of course I had to get it with my $25 Sephora Reward Card . . .
Yay! I can’t wait to hear what you think of the colors. Oh my gosh this palette is too gorgeous! Love the heart shaped shadows! I agree Tina! So cute! I can’t say I love every shade but I’m like Allison and I’m buying it today. I have a thing for hearts and there are enough shades I’ll love. It is disappointing about the purple that isn’t purple though. Yeah I hate it when that happens with purple. Thank you so much for the compliments on the swatches!